SHA uses source control BMPs to remove trash, sediments and other debris that collect on roadway surfaces and contain harmful pollutants before they are washed into adjacent waterways. Mechanically sweeping the roadway collects and removes trash, leaves, dirt, sand and other debris that accumulates along curbs, gutters, and bridge parapets. The material is then properly disposed of in approved landfills. 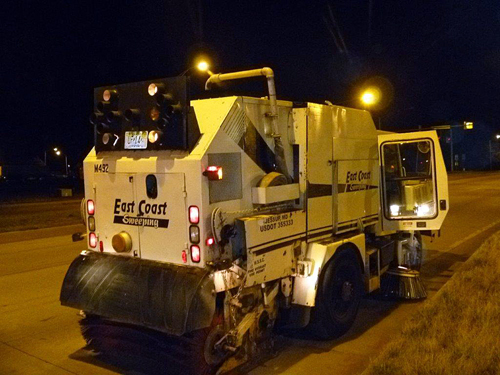 Street sweeping provides two benefits: it first prevents buildup along roadways and allows for water to flow freely from the highway and enter into the highway drainage system. Secondly, it removes harmful pollutants caused by passing vehicles or pollutants washed onto the roadway from adjacent properties before reaching local waterways. 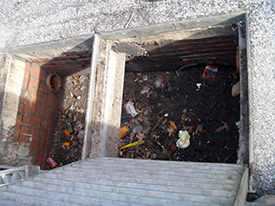 Catch basins and inlets are structures along closed storm drain systems that allow water to flow from the roadway surface into an underground network of pipes. Closed storm drains discharge runoff into open ditches, channels or waterways. 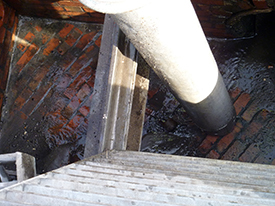 Catch basins and inlets often capture sediment and debris preventing it from the entering waterways and are cleaned periodically using vacuum trucks. Before and after photos of inlet cleaning.